On top of Our Harry Kane signing a new six-year contract, I hear Christian Eriksen, Dele Alli, Hugo Lloris and Jan Vertonghen are about to commit themselves to long-term futures at Spurs � plus there could be an exciting newcomer in the shape of Aston Villa midfielder Jack Grealish. Talks are under way to try to bring Grealish to the new Lane, as � sadly � his once proud old Villa club fights for survival under a huge financial burden. You might offset a personal financial burden by utilising this bet365 bonus code page. Those reading my Danny Blanchflower book serialisation will know that he was a fairly fruitful import from Villa. If Grealish could be half as successful as Danny in a Lilywhite shirt there are good times ahead! 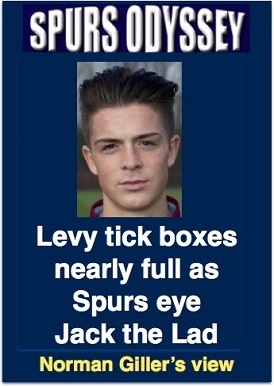 Grealish is a bit of a �Jack the Lad�, but he has an excellent footballing brain that would benefit greatly from the coaching skills of Professor Pochettino. It will stick in the craw of some of his critics, but surely it is time to bow the knee to the stewardship of Daniel Levy, whose tick boxes are gradually filling up � state-of-the-art stadium built and soon to open its doors � Pochettino and coaching staff signed � Harry Kane signed � most of the first-team squad happy to accept new contracts. Levy has finally smashed the tight Tottenham budget restrictions as the club prepares for a new dawn, a new day and new horizons. A good time to be a Spurs supporter. As our attention switches to the World Cup on Thursday, all our best wishes are with Captain Kane and the Spurs crew of Dele, Kieran Trippier, Danny Rose and Eric Dier, plus Gareth Southgate and his entire squad. We shall also be keeping an eye on all the Tottenham overseas players involved in the greatest soccer show on earth, and in particular the Belgian brigade. That will be an interesting encounter when they come up against England on Thursday June 28th. I just hope they all come through unscathed and ready for, potentially, one of the most exciting seasons in Tottenham Hotspur history. WITH the greatest respect to all at Barnsley (and in particular my old newspaper colleague Sir Michael Parkinson), Danny arriving there in the spring of 1949 was like a Goya masterpiece being hung in a chicken run. They were a Second Division club with a history of taking part rather than winning; an unlikely FA Cup triumph back in 1912 was their one claim to footballing fame. Danny�s dream of full-time professional football was shaping more as a poisoned chalice than promised land, particularly as his younger brother Jackie had landed a treasured place with Matt Busby�s esteemed Manchester United club. Danny left Glentoran under a cloud of disillusionment. A verbal promise that he would be paid a third of the transfer fee was ignored, and he reluctantly accepted �700 as a parting payment. When he asked what the fee had been the two clubs refused to tell him in what were Soccer Slave days. It later transpired that Barnsley had paid �6,500 for his signature, so he felt cheated out of �1,466, a tidy sum in a football world that was like another planet compared with today�s game and its astronomical � some would say, obscene � wages. To rub it in, Danny later learned � look away, Spurs supporters � that Arsenal had wanted to sign him from Glentoran, but made their move too late to stop Barnsley landing him. He did his best to settle in at Oakwell, and played well enough to start becoming a regular member of the Northern Ireland international team. A fractured foot interrupted his career, and he was soon provoked into more battles with the management, first over his wages and then because of the thorny old subject of training without a ball. It was twenty years later during a lunch in the Express Newspapers boardroom hosted by group owner Sir Max Aitken, son of Lord Beaverbrook, that I got Danny reminiscing on his days at Barnsley. Sir Max had been a decorated World War Two pilot and Danny was fascinated to listen to his experiences, confessing that he was envious because he had never got to fly after training as a navigator. �When I agreed to sign for them I had not a clue where the club was. All that interested me was that it was a passport into the English Football League. It was quite an eye-opener for me to find it was a coal town, and to this day I have rarely seen a more dismal, depressing yet strangely beautiful view than the slag heaps as I arrived at Barnsley train station. There was nobody to meet me and I felt like a refugee from another land. Oakwell was a surprisingly tidy and well-organised ground, and with a regular crowd of 20,000. It had an atmosphere all its own. They were always warm and welcoming to me. You�ve not heard anything until you�ve heard 20,000 Yorkies baying for blood, like the Roman Colosseum baht �at. The Northern Ireland selectors monitored my performances and I must have played reasonably well because they selected me for my first cap against Scotland at Windsor Park. We lost 8-2, so we�ll draw a veil over that one. A few weeks later Leicester City�s Ken Chisholm trod heavily on my foot and fractured a bone. That put me on the sidelines in a plaster cast and when I returned to start training I politely asked for a ball to run with. You�d have thought I was asking for the Moon. �Manager�s orders, no balls until match day,� said the trainers. I was moved to tell them it was a load of balls. 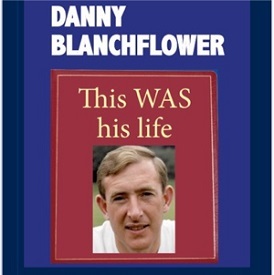 The Blanchflower-Seed rapport was broken beyond repair the following season when Danny again went into battle for what he considered the sane and sensible demand to train with a football at his feet. Seed, brother of 1921 Tottenham FA Cup star Jimmy Seed, took the stance that he was trying to undermine his position as manager. During a heated argument Danny said he would rather play for a club where they could practice with the ball. 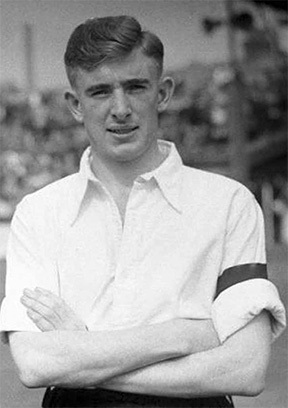 Seed took that as a transfer request and clubs were circulated that Blanchflower was for sale. Weeks went by, apparently without any interest from other clubs, which was a blow to Danny�s huge ego. He meantime hid the fact that his pride was hurting, and he continued to play to the best of his ability. In his spare time he studied in the evenings for a science degree at the Barnsley Technical College. Among his fellow students was a young man who worked during the day on the switchboard at the Barnsley telephone exchange. Danny looked at him puzzled. �And why would I be going there?� he asked. It transpired that the operator had been listening into the Barnsley Football Club calls, and the only person who did not know of any approaches for Blanchflower was Blanchflower. He encouraged his informant to gather any facts he could from future calls, and each day he would ask the club if there had been any inquiries, while armed with the knowledge that there had been. Each time the club officials told him that no club had been in for him. Danny was just preparing himself for a showdown � the slave standing up to his masters � when he got a call from the Barnsley chairman Joe Richards, a self-made millionaire who was later to become President of the Football League. The slave was not to know his destination. Even his switchboard friend did not know where he was going. Richards arrived at Danny�s digs in a chauffeur-driven Rolls, and Danny was taken to a Derby hotel and hidden away in the kitchen while the cigar-chomping Barnsley chairman completed his negotiations with the undisclosed club. Understandably, Danny felt like a piece of meat being traded without any say in the deal or in his destination. "I was being sold like a Barnsley chop,� he said with his gift for perfect metaphors. Danny got his revenge many times over with scathing criticisms of football club directors in his later newspaper columns and broadcasts. That was all Danny wanted to know, and he agreed to become an Aston Villa player. There was one other thing he would liked to have been let in on: the fee. George Martin was from the school that believed those sort of things should be a private matter between the clubs, but he allowed himself to give a hand and fingers signal of how much Villa were paying. Danny was about to become a Villan. Join us next week for the fourth instalment in the Danny Blanchflower story that Eamonn Andrews could not tell. Tottenham will soon be on the horizon. Which current Tottenham player once scored in a Champions� League victory over Barcelona and has a sister who is a basketball player in the USA? Please email your answer to me at Teaser6@normangillerbooks.com. Deadline: midnight this Friday. No prize, just pride and the satisfaction of being right! Last week I asked: Who was a loser and then a winner in FA Cup finals with Spurs � and was just 17 when he played in his first FA Cup final? As if I could get that one past you know-alls. Most of you quickly twigged that it was Paul Allen, who had played in his first FA Cup final with West Ham when he was just 17. He became a part of the wonderful Allen dynasty at Tottenham. Thanks for your company. See you same time, same place next week. COYS.